Tori's Dew Drop Inn Tour began in the UK on February 23 in Ipswitch at the Regent Theatre. She delighted audiences in Europe for over a month, and then toured across North America (several times actually!). The tour ended on November 11th 1996 in Boulder Colorado. The original plan was for her to return to Europe for more tour dates, however, that did not happen. Tori also did not tour in Australia this time around. She needed a break after the US dates, and it was apparently too expensive to gather everything up again and head down under. Early in the tour, her shows were in medium or small indoor venues. During the summer, some of her concerts were in larger outdoor places like Jones Beach, NY, where they have both covered seating and a lawn. Tori played some cities in the US twice during the tour, like Atlanta and Boston, and she played Buffalo NY THREE times! Early in the tour, I was a little concerned about Tori's health. In the May 8-15 issue of Time Out New York Tori says, "...I'll be 33 this summer. To tell you the truth, my body is starting to hurt." Concern was also expressed after the taping of the Unplugged show, because she struggled through some of the songs and had to leave the stage a few times to pull herself together. Tori explains in Time Out that is was the lighting and sound that initially caused problems, "With that made-for-TV light, everyone was lit--it really threw me...Also my sound has to be in your belly, but there were concerns about creating feedback on tape." The tour schedule was very ambitious, but she managed to stay healthy most of the time. She seemed fine at the shows I saw, and she performed what may have been one of the best concerts of her life in Cincinnati Ohio, June 3rd. On October 23rd in Miami Florida, Tori did stop playing after 5 songs and told the audience that she was too sick to play. 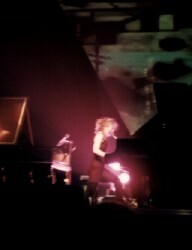 But after a 10 to 20 minute rest she was able to continue and finish the show. That is the only time during the tour when that happened though. She did not disclose the details of what made her feel ill. Her opening act through mid-August was singer/songwriter/guitarist Willy Porter. He got the biggest reaction when he playfully did a Jackson 5 cover (I Want You Back) complete with a falsetto voice, and a tune he wrote called Jesus On The Grill. He was very personable and got along well with the crowd. His current album is called Dog Eared Dream. His set often included a song called Cold Wind, that told the story of a gay man he knew who died of aids, and the struggles he endured during life. I was really touched to hear a straight man sing a song like this. It gives me hope that maybe the world is not so hostile. A new opening act joined Tori beginning in Pensacola, August 10. His name is Josh Clayton Felt, former singer/guitarist of the rock band School Of Fish, who sings and plays acoustic and electric guitar. The initial reaction from the fans to him is favorable, though most still seem to prefer Willy. I met Josh in Bloomington Indiana in September, and he was very friendly. Tori entered the stage every night with "Son Of A Preacher Man" playing on the speakers. She usually did an energetic two-handed wave to the wildly cheering audience before sitting down at the Bosey. Tori played most of the concert by herself. She sat between a piano on the right and a harpsichord on the left. There was also a harmonium organ that replaced the harpsichord for the final song or two most of the time. She sometimes wore headphones when playing the harpsichord. She used pre-recorded loop tracks on only one song, the remixed version of Talula. For some of the songs she was accompanied by Steve Caton on guitar. He has been involved with Tori since the Y Kant Tori Read years. Most feel he added a new dimension to the show. Unlike many musicians, Caton is usually able to keep up with her improvisations. The concerts were lasting approximately 1 hour and 50 minutes early in the tour. Toward the end of the tour, the shows were shortened to 90-100 minutes. The stage was set up with mobile lamps moving about, a backdrop of stars, and a striking triangular screen where videos were often projected. These videos included primarily colorful, abstract designs and stuff like old war planes, waves, or fire. I think it complemented her music perfectly. During this tour, Tori continued her practice of changing things around every night to avoid becoming a "jukebox". 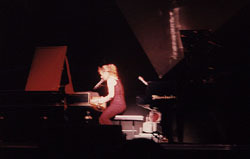 However, she began EVERY show with Beauty Queen/Horses and ending many concerts with Hey Jupiter on the harmonium organ. 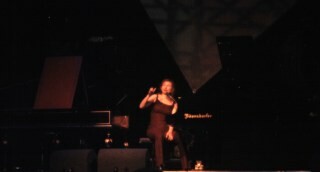 As the tour progressed in North America, she often left out Hey Jupiter, and finished her concert with songs like A Case Of You,Song For Eric, Silent All These Years, Bells For Her, Black Swan, Purple Rain, Sister Janet, Past The Mission, Angie, Daniel, Winter, and even Etienne from YKTR instead. On September 18, she ended the show in Muncie Indiana at Ball State with Killing Me Softly! Here is a complete list of covers she did completely or partially during the tour. She delighted Knoxville TN by ending the show with Songbird by Fleetwood Mac, a cover she has not performed in 15 years. On her birthday, August 22, she sang Madonna's Live To Tell for the crowd in Greensboro North Carolina. The real shockers were her performances of Etienne in Washington DC, April 28 and Cool On Your Island in Philadelphia, May 3! Both these songs are from Y Kant Tori Read. Tori has apparently accepted this part of her past. Starting in June, Tori began playing both these YKTR songs periodically during the tour. On October 19th in Clearwater FL, Tori performed another YKTR tune, Fire On The Side. I saw Tori before her soundcheck in Muncie Indiana on September 18th, and I asked her to play Killing Me Softly, which she had yet to do on this tour. She did it for the first time that night! Tori performed The Waitress for the first time in West Palm Beach FL on October 24. God was finally played for the first time on August 16 at the Wolf Trap in Virginia. She did not perform a complete version of Professional Widow until her last show in New York May 15, where she played it on the harmonium organ. She continued to use this organ each time she played Professional Widow, which was not very often! Caught A Lite Sneeze was excellent and very different from the album version. Tori still performed Me and a Gun almost every show, and the lines "You can laugh/it's kinda funny/things you think/times like these" have returned. She avoided this part of the song during the Under The Pink tour for reasons I do not know. 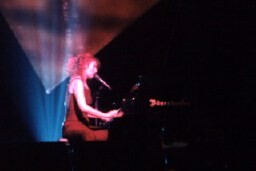 In Portland Oregon on July 21, 1996, during the second show that night, Tori surprisingly did NOT sing Me and a Gun. As the tour progressed, older songs were more prevalent, and some of the Boys For Pele material that was so pervasive early on (Not The Red Baron) was left out. Richard Handal wrote an review which made an interesting point about Tori's shows. She often will use pieces of a song, either hers or someone elses, in the middle of another song or as a bridge from one song to another. That made composing set lists difficult sometimes. How much of a song does she have to sing to merit mention on a set list? There were also reports that Tori was sneaking little bits of new material into her shows and sound checks. She sang a brand new song in Miami on October 23 called Cooling, that she said should have been on Boys For Pele, but which will be on her next album! The merchandise that was available at the shows included a variety of white or gray t-shirts, many with artwork from the Boys For Pele CD and the tour schedule on the back. Other items include a "recovering christian" shirt with a picture of a nurse on the back (which really did not look like Tori), and a Tour Book designed by a friend of hers named Rantz and contributed to by Neil Gailman. There is also a cross pendant with "Tori Amos Dew Drop Inn" on one side and "We Both Know It Was A Girl Back In Bethlehem" on the other. An orange hat or cap was also for sale early on, but most people thought that is was pretty awful! At my Cincinnati concert there was a t-shirt that I never saw before, a black one with a cool picture of Tori on both sides of it, looking very intense. One side says 'Tori Amos' and the other 'Tour 1996'. I think this was the best shirt yet available and it replaced the 'recovering christian' one. The photo on that shirt was later available as a poster. What an incredible and epic tour this was! I am really sad that it is over. Now we wait patiently for the next tour in a few years.